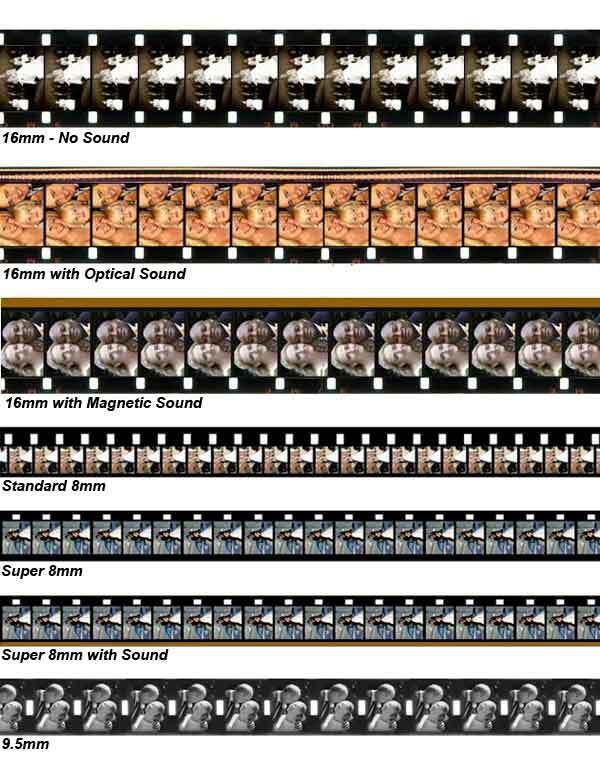 What follows is a comparative guide of Super 8, Standard 8mm, 16mm and 9.5mm cine film. An easy way to identify the film you have is to measure the width. This will be 16mm, 9.5mm or 8mm. There are two types of 8mm film. There is the older format Standard 8mm which was later superceded by Super 8mm cine. 16mm is easily identified by measuring the width of the film - it is 16 mm across. If there are sprocket holes on both sides of the film, then the film is silent. Sprockets on one side of the film indicates that that there may be a soundtrack. There were are two types of sound track (as shown below). The first is a brown magnetic strip down one side of the film. 16mm was made by a variety of manufacturers including Kodak, Agfa, Fuji, Ilford, and many others. 16mm and a variant called super 16 is still in popular us today by professional film makers. The academy award winning The Hurt Locker was shot is 16mm as was Spinal Tap. Other examples of professional 16mm usage are The Crown, The Ascent of Man and Life on Earth. Super 8 and Standard 8mm cine film measure 8mm across the width. If you have found some reels of home movie cine film, it will normally be Super 8mm, Standard 8mm, or than likely, a mixture of the two. In 1932 the Eastman Kodak company released the Cine Kodak Eight which used Regular 8mm film (also known as standard 8mm film). 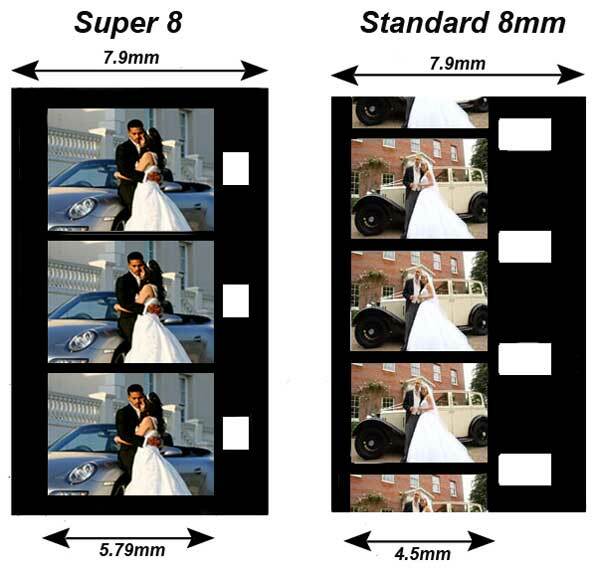 Regular 8mm film is similar to 16mm film except that it is only 8mm wide and only has sprocket holes on one side whereas silent 16mm film has sprocket holes on both sides. Super 8mm film came later as a technical innovation. The sprocket holes were made narrower so the frame size of the film could be larger, thus increasing image quality and sharpness. Below are what the silent versions of these film sizes look like. 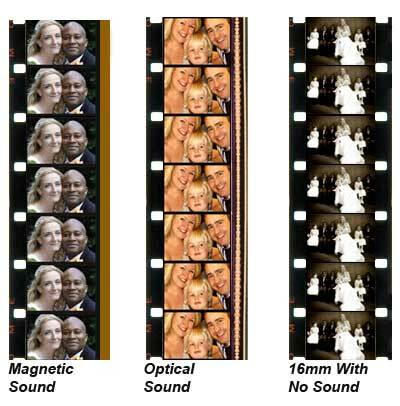 If there is sound on the film, then you will see a brown magnetic stripe running the length of the film on one or both sides. 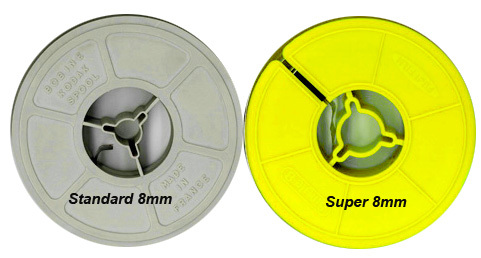 Another easy identifiable difference between Super 8 and Standard 8mm film is the size of the central hole in the reels. If you have 8mm cine film that looks like the photo below, then you have an undeveloped 8mm cine cartridge. There is also a possibility that it is unused and fallen out of the box. Please note: We do not process undeveloped cine cartridges. Popular brand names include Kodak (Ektachrome, Kodachrome), Fuji, Agfa and Ilford. You will be charged by the amount of cine footage you give us, so don't worry if the cine reels do not look completely full. 9.5 mm film is a format used mainly by amateurs and was manufactured in 1922 by Pathé Frères as part of the Pathé Baby system. It was a budget film format with the aim of providing copies of commercially made film to home users. Shortly afterwards, a 9.5mm cine camera was manufactured. 9.5mm cine film became popular in the 1920's and was available initially in black & white and then in colour. Brand names include Pathé, Pathéscope and Pathex. 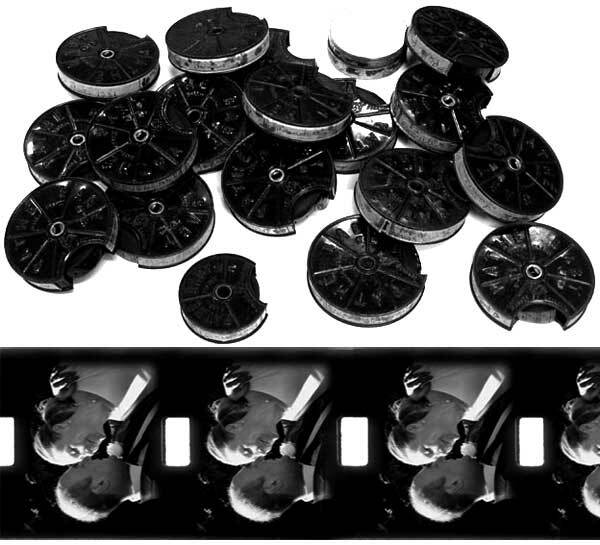 One of the reasons which made the Pathe cine system so popular was easy loading film cartridges, shown below. Home movie film was usually supplied on rolls 9 metres ( 30 ft) long. 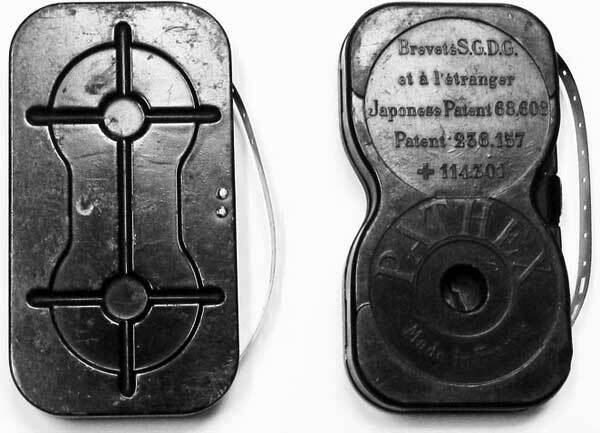 It may have been supplied in easy load cartridges (as above) but was also available as spool loaded film. The latter came in 50ft or 100ft (15 or 30 metres) lengths. Before the First World War, the most popular film was known as Ortho Reversal. After the war, Panchromatic film was produced. 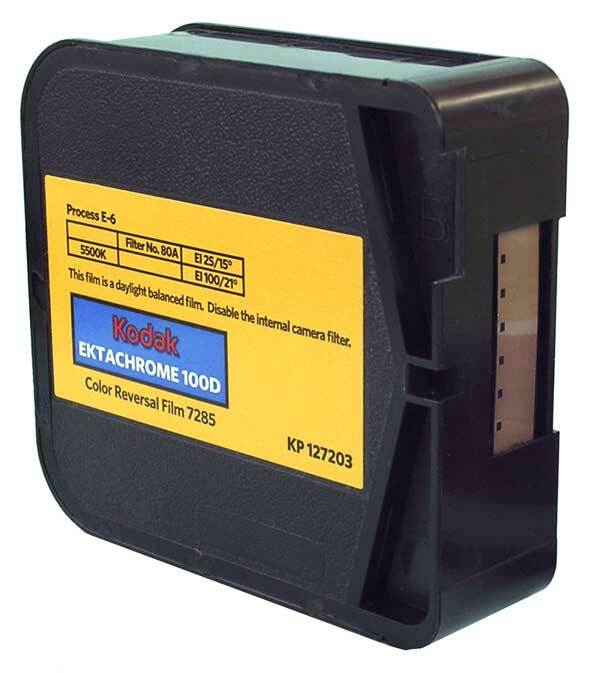 In 1953, Kodak introduced 9.5mm Kodachrome which was a colour film. There were many cameras and projectors made for 9.5mm cine film. Amongst the most successful was the Pathéscope H cine camera and the Gem Projector.